I have 2 kids, I swear. You’re probably reading my posts thinking “Where’s that Olivia kid she mentions every once in a while?” I swear she’s not off in a corner somewhere left to entertain herself. Sometimes she’s snuggled up in her wrap sleeping (baby wearing is EVERYTHING with two under two), and other times she is sitting with us watching the excitement unfold but it’s easy to lose sight of 0-3 month old activities as being “educational”. Well guess what Olivia – THIS ONES FOR YOU! The truth is, planning activities for very young babies is hard. The main reason it’s hard is because so many of them are common sense things to do, so you think you aren’t doing anything all that special – but you most definitely are! When it comes down to it if you are playing with your baby, talking and reading to your baby, and giving them lots of love you are helping them to learn. 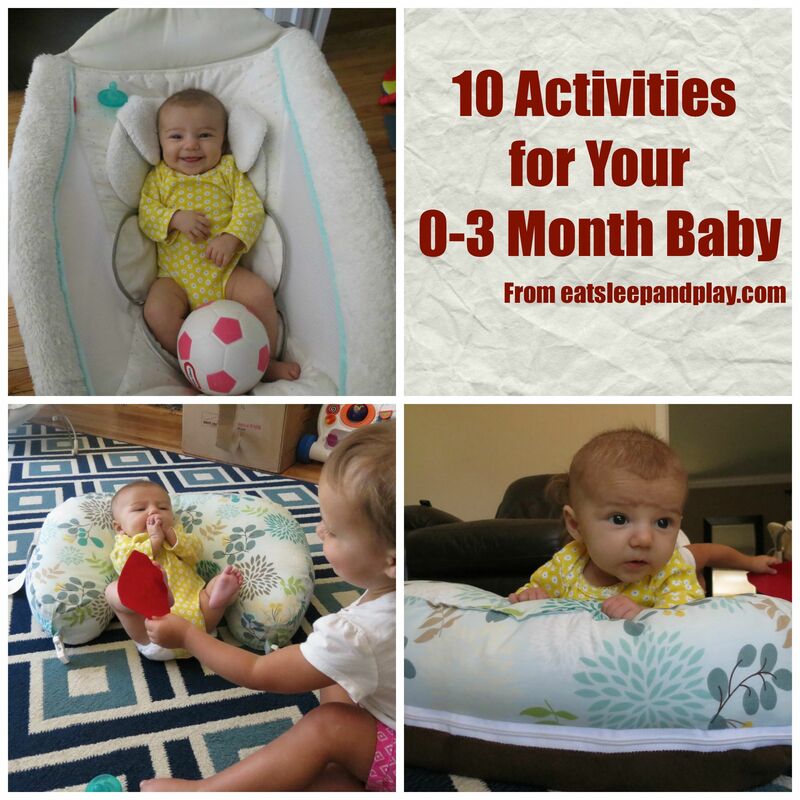 If you want to take it up a notch, here are 10 activities you can try with your 0-3 month old baby. Finger Puppets (Visual stimulation and interactive play) Don’t have a set of puppets? Make your own! You can do this by wrapping construction paper around your finger and drawing a simple face. Don’t forget young babies have limited vision, you don’t need to be Picasso here. Super Scents (Developing senses-olfactory) While your baby is seated, bring some containers of spices close to their face so that they can smell them – but not so close that they are inhaling it. Many spices such as cinnamon, cumin, ginger, nutmeg etc. have strong scents that baby can smell and will react to. You can also do this with foods that may have a distinct smells such as lemons. My older daughter still loves to do this! Telephone Whispers (Auditory Skills) Use a paper towel roll to whisper into each of your baby’s ears. They will likely turn their head to see where the sound is coming from. Move your mouth away from the tube and talk so that they can see the source of the sound. Key Shake (Auditory and Visual Skills) My first was never much into plain old rattle toys, but she loved (and still loves) keys. When your baby is seated shake a set of keys all around. Once they identify where the keys are move them to a different area and see if they can find them again. Texture Tickle (Stimulation of Central Nervous System and Interactive Play) Choose various soft objects to rub on different areas of your baby’s skin. Try different textured cloths or feathers. You can even try various temperatures, but make sure whatever you use is not too hot or too cold! As you rub the items on their skin talk to you baby and name the body parts you are touching. Just like baby massage, this can stimulate lots of nerves as well as benefit your baby’s emotional well being. 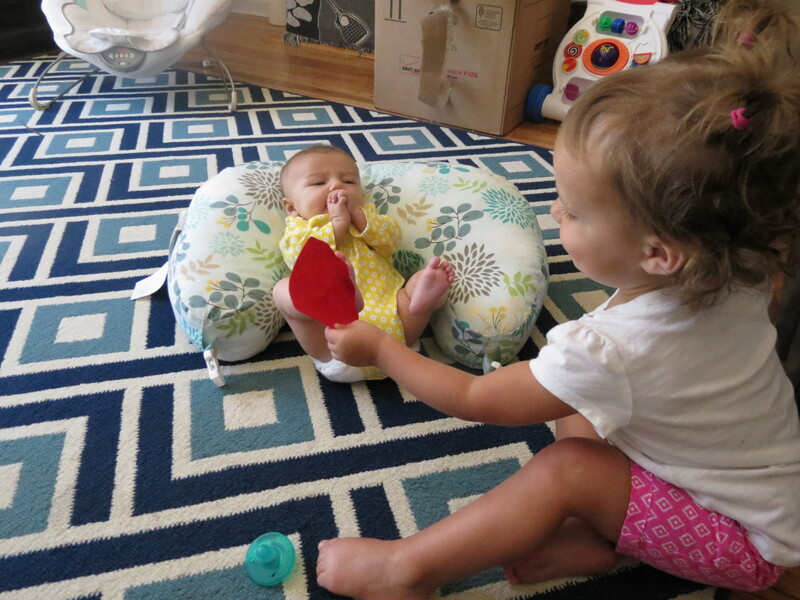 Mirror Mirror (Visual and Gross Motor Skills) Choose a baby safe play mirror and place it in front of baby. Point to their face in the mirror and name their features. Get behind baby so they can see you in the mirror too- they will definitely recognize that face! Read, Read, Read, READ (Early Literacy Skills, Auditory Skills) Sorry it’s the first grade teacher in me. There is nothing you can better do to prepare your child for school than reading – even as babies! You might feel silly but they are taking in everything. Need some suggestions? Check out our top 20 board book recommendations. Kick it (Gross Motor Skills) Have baby lay on their back and place soft items at their feet (such as a pillow, stuffed animal, cloth toy etc). When they feel the items touching their feet they will kick back! 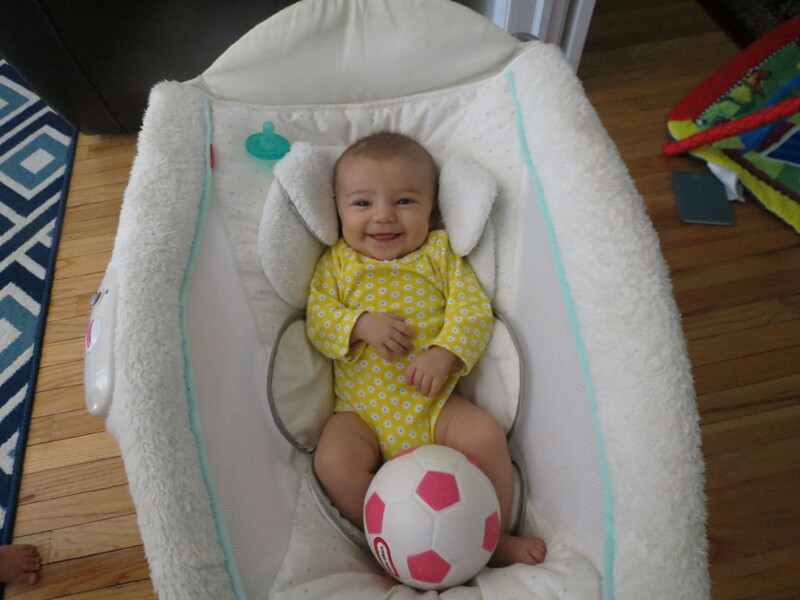 My oldest daughter likes to put a soccer ball in Olivia’s rock and play to kick (along with snacks that she thinks she is sneaking to her). Believe or not she kicks the ball around and they both find it hysterical. Target Practice (Visual and Gross Motor Skills) When baby is laying on their back place toys so that they are hanging over them. Most of us have some type of baby play gym that has hanging toys- but be sure to switch it up! Most of your child’s toys have a loop or hook to hang on their stroller or car seat- use this to add news toys to their play gym. Tummy Play (Gross Motor Skills) – Does any baby actually like tummy time? Not mine. They always flop around and get frustrated (although this is necessary for neck strengthening). 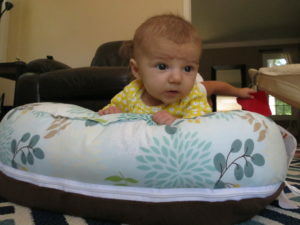 To make some of their tummy time more enjoyable grab a pillow, or rolled up towel to place under your babies chest. I always used my boppy pillow for this. When babies heads are propped up like this they can see more (like you!) and will be more inclined to play with toys that you place in front of them. What activities do you like to do with your new baby? Let us know in the comments below! Love all these tips I am going to share them . Though it seems like these are obvious that isn’t always true for new parents.My kid are older now but I would have loved to have read something like this when they were babies, especially my first one. Where did you get your rug from? Zoo Animal Bingo at the Zoo!